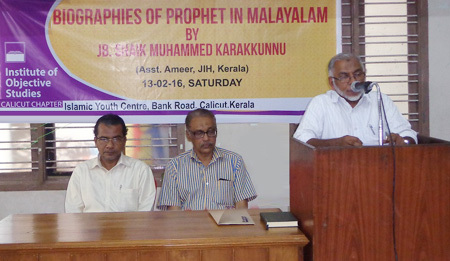 Calicut: IOS Calicut chapter organised a lecture on the Prophet’s (PBUH) biographies in Malayalam on 13th February here. Sheikh Muhammad Karakunnu, the learned speaker who is currently the Asstt. Ameer of Jamat-e-Islami Hind, Kerala observed that Malayalam is rich in seerah. There are many original works as well as translations brought out by many publishing houses and several of them are in print. Biographies of the Prophet (PBUH) are mostly best sellers. There are around 150 biographies in the language: excellent original works like Muhammad Nabi, Jeevithavum Sandeshavum (Prophet Muhammad, Life and Message) by Prof P K Muhammad Ali, which is a well- documented work. It has run into many editions, Karakunnu added. Islamic Publishing House has translated Seerah by K L Gauba, Abu Salim Abdul Hayy, Naeem Siddiqui and Ramakrishna Rao and these titles have helped remove many misconceptions about Rasool Kareem (PBUH). Karen Armstrong's excellent biography was rendered into Malayalam as soon as it appeared. Another notable translation is Martin Lings's Muhammad (PBUH). Hayath Muhammad of Muhammad Haykal, the renowned Egyptian scholar, was translated into Malayalam two decades ago. It has run to many editions and still has brisk sale. Later, Karakunnu replied to queries from the audience made up of many scholars and academics. Mr A A Vahab, Director of IYC scholarship programme, welcomed the audience. Prof P Koya, the coordinator of IOS Calicut chapter, presided over the session.